“Play the hand you’re dealt.” Even non-poker players like me understand the meaning. It’s the only strategy worth deploying. That doesn’t mean we people don’t react in other ways. They often do. For starters, they whine and complain. Cause it’s fun to enjoy the sympathy of others. The root of complaining is envy and jealousy. Comparing our “cards” or life circumstances against others who we think have it better. It’s not fair. We want what they’ve got. There are people less qualified than you, with fewer advantages than you, doing the things you want to do, because they decided to take responsibility for their own life. They believe in themselves. They also believe their life’s outcome is their fault. You’re holding cards in your hand. Sure, let’s assume the real truth – much of it is random. You had no say in who your parents were. Or where you were born. Or how you were raised. Or where you were educated through high school. You didn’t have any say in how short or tall you are. How athletic or unathletic you are. How musical or unmusical you are. Whether you love to read or hate it. Whether you love to write, or never write. So much of what defines you seems random. But the results of that randomness is what you’ve got to play with. It’s the hand you were dealt. Now what? This is where we need to employ a bit more logic and less emotion. Lean left. The left hemisphere of your brain. Focus logically on where you are, not where you wish you were. You can feel an array of emotions about your parents, or where you grew up, or any of the other circumstances of your life. Part of maturity is adding the coping skills necessary to navigate life successfully. It’s why we behaved like idiots when we were kids. We didn’t have the skills or wisdom to always make the best choices. Mostly, we made decisions on what we wanted to do at the time. Fun was likely the main objective. “Seemed like a good idea at the time,” probably summed up our teen years. But things changed. We grew. We say we grew “up.” Nobody says, “I grew down.” We grew up. We grew past something. We got over it, like any other hurdle in life. Growth. Improvement. Transformation. Now, we’re grown up. Mature. Are we gonna focus on how bad we’ve got it? Are we gonna look at others and wish we had it better? Are we gonna blame everybody and everything for our life? Go ahead. It won’t work out well. Never does. Instead, let’s go back to the cards you’re holding. There’s only one strategy you can deploy. Just one choice if moving forward is your goal. That means you accept the fact that these ARE your cards. Wishing you had one card different. Or wishing all five cards were different won’t change them. How is that strategy or tactic going to help you? It won’t, but an awful lot of people do that instead of playing their cards. They fret, worry, agonize and lament how awful their cards are. Telling anybody who will listen how badly they’ve got it, too many folks want sympathy instead of growth. Let’s play that game out. The Sympathy Game. Okay, complain and moan. Increase the number of people who feel badly for you. Double the number. Triple it. Multiply it by 100. or 1000. Feel better? Did the increased number of sympathizers really serve you? Help you grow or improve? Of course not. But it likely made you feel better. Like drugs, or alcohol. Quick fix with lots of long-term devastation and pain attached. The real help – where you’ll find the real service – is accepting responsibility for your own life. The pronoun reveals true ownership. It’s YOUR life. I know the word “fault” is polarizing. That’s why I’m using it. To impress on you that hiding is useless. And to impress on you that ownership is your best option for growth, improvement and transformation. Any other choice is fruitless and damaging. It’s not just one or the other. As the owner of a business, you’ve added a big ownership piece to your life. Let’s roll your ownership into one big YOU because it’s your complete, total life. Business and personal. You think it feels bad – maybe even wrong or inaccurate – to say everything is your fault. Permit me to make a case to show you the upside. Hint: there is no downside. One, you don’t waste time on unproductive activities. Assigning blame takes mental and emotional energy. It also takes time. Plus it fosters in you the tendency that we all have…to find fault in somebody or something else. Do those poor feelings make you a better person? Nope. They certainly don’t save you time. And your life is largely defined by time. So it’s a colossal waste of your life. Besides, fostering ill feelings toward others is no way to live. That just takes you down the rabbit hole of assigning WHY behind what’s happening, or what has happened. You’re looking for reasons now. More wasted time. More wasted energy. More fuel to your ill feelings. Two, it won’t change the present or the past. If complaining worked, we’d all know it. There’d be empirical evidence that it’s an effective strategy. Complaining and blaming others has never altered the smallest thing that has ever happened to you. Or the smallest thing that may be happening to you right now. Never. Ever. It’s not going to work. Ever. Three, there’s high value in accepting blame (responsibility, fault, or whatever else you’d prefer to term it) even if you’re wrong. “But it really isn’t my fault,” you may say. Many do. Okay. No argument. But what if you just own it anyway? This is a value proposition. Is there value in you accepting the blame versus you refusing to accept it? Yes, there is. If you can get past your pride and ego then you can find the path to real contentment in acceptance. That’s where the growth is! Your growth! 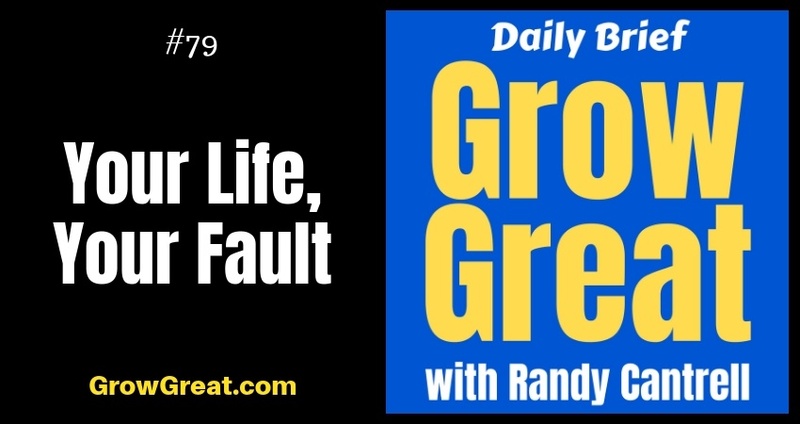 All that stuff happening inside your business – and your life – is your fault. The sooner you accept it, even if it’s not true, the quicker you’ll start finding true growth and improvement. Few things will have a more positive impact on your life. I can’t think of anything that will make a bigger change in your life TODAY. Than you accepting the blame for it all. Because when you do, you’re immediately telling yourself, “I can change it.” There’s my sales close on this idea. This truth. The second you’re able to accept that it’s all your fault, then you’re naturally saying to yourself that you have the ability and power to alter it. It’s the power you’re waiting for. The permission you need. Suddenly, that cavalry or lifeboat you’re waiting on disappears because you realize you don’t need it. Waiting isn’t going to help. Nobody is coming to save you. Others can help you, but you’ll also instantly realize that the others you’ve been surrounding yourself with – the people who listen to your complain or sympathize with your complaints – they’re not truly serving you. Knowing and accepting the truth that your life belongs to you – and not to anybody else – is liberating. Empowering. Why would I want you to remain stuck? Why would a guy with a podcast called GROW GREAT want you to do anything other than that – grow great? It’s your life. So accept the truth that it’s your fault. It’s step one to a much better life.